May 5, 2014, Halifax, NS – The Port of Sheet Harbour is pleased to welcome the E-Ship 1 during her inaugural call to the Port. The E-Ship 1 is a roll on/lift off (ro/lo) cargo vessel. She is owned by Enercon GmbH, a German windmill manufacturer. 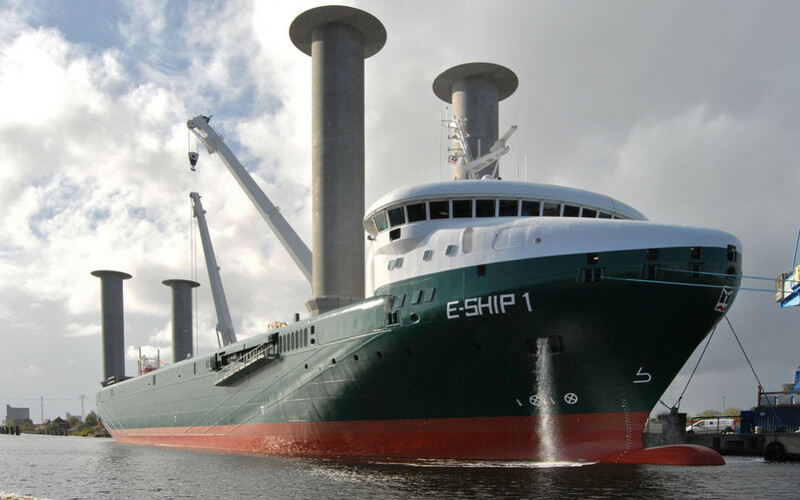 The E-Ship 1 was specifically built to transport windmill components. What makes the E-Ship 1 unique is her rotor-ship design. The ship is equipped with four sailing rotors, called Magnus or Flettner Rotors. These vertical cylinders generate a wind-induced propelling force which has a horizontal propulsion effect. The strength of this force depends on three variables: the rotation speed, the wind speed and the relative wind direction. If the wind allows for additional propulsion through the use of the sailing rotors, the number of diesel generators used to propel the vessel can be shut down accordingly. Located in ice free waters, the Port of Sheet Harbour features a 152 m berthing wharf, 35.5 m in width, with 10.3 m of draught connected to a large concrete pad. The Port is well-suited for marine and resource based industry, manufacturing, and transshipment opportunities.